Hey there Folks, Thanks for any help. Midway through my great uncles Arkansas Traveler 1966, and working through the motor. Looks like a Merc 120 and ID #3849449 on Block. here the deal- Can't reference any mercs with duel carbs? The block number says engine model years 1970-1972. this boat is a 66. Did my uncle replace the original motor? I have pics of this full restoration I will post them in another category I suppose. hopefully the picture I'm trying to download goes through. If not I'll get it. That is an early OMC 120, not MerCruiser. Eh, Ok. Makes perfectly goos sense now. I was putting the gauge cluster back on the dash today and it says OMC sterndrive. What do you think about this engine? do you know much about it? The hour meter claims 66 hours, and so far I have a new water pump, plugs, wires, blet, and rebuilt carbs. have not fired it up as I got carried away with all the sanding and and primer/paint work. shouls have her running in a couple weeks. 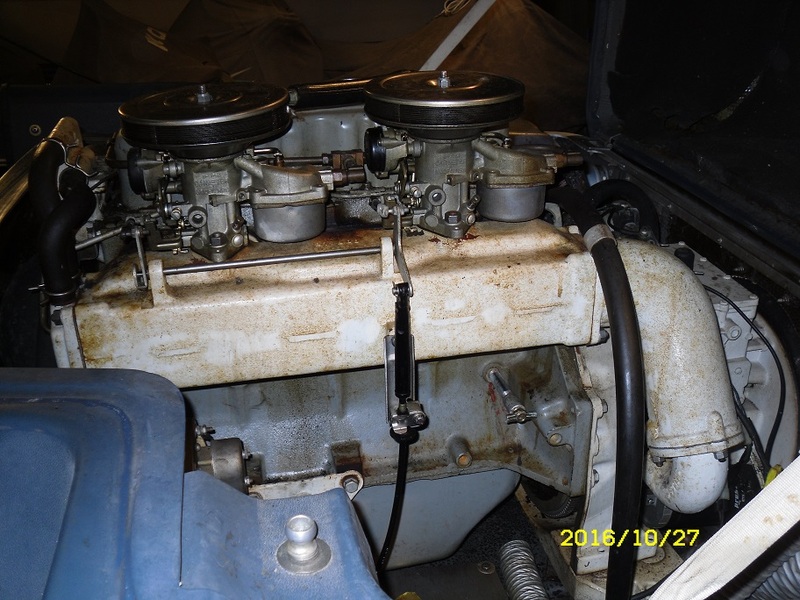 Assuming that is has always been taken care of properly & not frozen because of bad winterization job, it will run about forever; It is the same 153 CID GM block that MerCruiser used. Now, you said "new water pump". Are you talking about the circulation pump on the front of the engine (behind the pulley & belt) or the impeller in the lower unit? About your OMC Stern Drive: There were 2 different drives used on the early 120 HP. They used the smaller "DU" drive and the larger "Heavy Duty" drive. The heavy duty drive would be the more desirable one but it is what it is. Use only Type "C" gear oil (also known as OMC Premium Blend). Regular 80/90 like most other drives use will cause problems. Don't run it with the drive tilted except at idle for minimum amounts of time. Parts are a bit hard to find, especially with the "DU" model. Hour meter most likely failed years ago. Ok, Got it. I was umder the dash and found the soldered wire, and and aftermarket hour meter it is. And, in fact a water circulation pump, not the lower unit. The local marine supply shop had mentioned that parts for these older lower units are hard to find. How do I identify if it's Heavy duty or DU? I have pics posted under the Project forum Labeled (Uncles 66 traveler restoration) or something along those lines, you might be able to tell what it, if you would be so kind. I charged the battery and will be firing the engine after sitting for about three or four years. Sounds like my gramps actually bought 2 new carbs. Initially I though they were rebuilt. The boat has been in a warm climate for most of its life I am guessing. I will not start this engine without dropping the outdrive. That is the full size HD drive. Ok, 1st let me show you my newest project. Got it a few weeks ago. 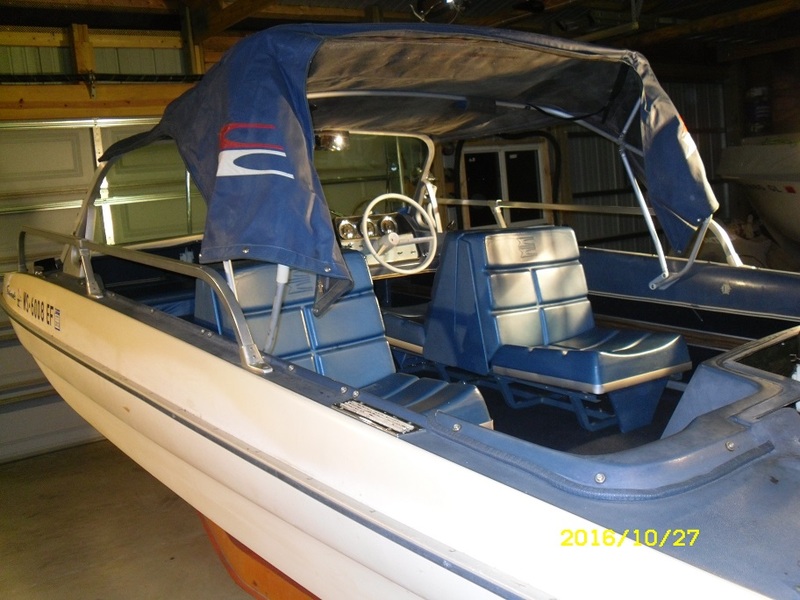 1967 Evinrude Sportsman 120, trailer and extras. Convertible top stretched to the snaps on a warm sunny day. It runs but needs some TLC. Should be my daily driver next season. Now for your questions; Prop may spin a bit from the swirling of the oil in the lower unit. The real question is if it is free wheeling or in gear? These electric shifts fail into neutral if the electric signal is lost. So I don't see how it can be in gear. The starter should not crank if the shift switch is not in neutral. But, perhaps someone has bastardized something in there? The throttle control box has a single lever shift. Straight up is neutral, fwd is fwd and back is reverse. The red warm up lever is to advance the throttle in neutral. You can set the choke (I don't know how old you are or if you ever owned a car with a choke) by pumping the main shift/throttle lever a few times & that is the preferred way in my opinion as it allows you to get full throttle action to actually squirt the accelerator pumps to "prime" the engine. Then, return the shift lever to neutral, pull the red lever back, perhaps 1/2 way & crank the engine. Only the fwd choke is used. The rear has no source of heat to open it. The spring (round black disc on the carb) needs to be set 1 1/4 turns clockwise from the neutral mark to hold the choke open at all times. The engine will start with just the front choke. After getting my 120, I did some homework & OMC says the flush adapter needs to be installed on the right side because the left water passage isn't used on the inline engines. But then again, maybe the kit included the plate with the water passage. Don't know, just be sure water is circulating & you will know. Hey Bud, Thanks for the insight once again. Yes, you new project is a real beauty. and looks like it's in good shape too. I had a willy's jeep and buick v6, but that's all I knoe of carbs. I can tear down a rebuild any efi Honda motor, but these older motors are new to me in terms of having it set up in a boat. Having said that, I run a helicopter fire fighting crew out in in CA. and lucky for me the crew comes with a helicopter mechanic. So today I brought the boat to work and tomorrow after work will will get in and get everything set up. and I will be learning. Interestingly enough the boat has only one choke, and my dad machined a plate to cover where the existing choke was on the rear carb. My gramps explanation was its warm enough out here boat don't need a choke. But the front carb still has the choke, and makes sense it is the functioning choke as it has a heat source as you mentioned. Thanks. Now, the shift lever is a mystery. I can see the throttle linkage move with the neutral warm up lever. How does the forward reverse lever control the throttle? should the same linkage move when I push the forward lever? Is the throttle electronically controlled via the siliniods when I push the lever forward? I will be going through the wiring tomorrow as well, I should have a better idea of what is going on here. I'll just have to figure it out. But the throttle linkage does not move when I advance the forward/reverse lever. and the water in circulating through the engine with the plate on the left side, I know that much so far. I looked at the parts blow up on the shift lever assembly. Used the link you sent me. I'm gonna have to tear it down and see whats going on in there. Looks like the throttle cable is muckered up. The lever should be moving the throttle cable from what I'm seeing. The red warm up lever moves the cable a small amount. The shift lever/throttle moves the cable thru its entire range of motion from idle to wide open throttle. Shifting is via a fancy, expensive, NLA switch that the handle also controls. There are no solenoids. There should be lite green & lite blue wires that control forward & reverse. Power into the switch (red wire) & out to the gear case thru the appropriate wire to the electric coil in the lower unit and then to ground. This magnetic field pulls the shift spring tight & locks the correct gear to the prop shaft. Green is forward, blue is reverse. I said in prior posts that there was a neutral safety feature but truthfully, I've looked at wiring diagrams & parts books & don't see that feature. (There is a throttle switch located on the 2 stroke DU motors). I've had Evinrude push button controls before and now do again & have 2 Johnson single lever type like yours also but can't remember & they are all put to bed for the winter so I can't check. The idle was screaming because the gasket was too thin, and the carb linkage was hitting the manifold, and the lowest I could get the rpm was 2400.
thicker gaskets gave me about 1/8 in, and adjusted the idle and now it purrs sweet. what Idle rpm do you set? about 800 or 900 seems nice for the engine. Worked out the shifting confusion and although the throttle cable is a little stiff, it moves the linkage to WOT nicely. Next gonna re-wire under the dash, and get it in the water! Any secrets on the oil inside the lower unit? That I should know about? and with the key in on position the shift goes into forward and reverse. I hand spun the prop slightly and it goes into both gears. How do I go about changing the drive oil? what oil do you recommend? Its been a long and humbling restoration and I am happy with the progress today. Idle as slow as it will smoothly idle. 600-650 in neutral will loose about 100 in gear. Bottom line is the lower the better for the shift springs in the lower unit and to allow you to move the boat slowly. Lower unit needs OMC "Premium Blend" also known as "Type C". Sierra and LubraMatic make some also. 1) Go to Evinrude dealer and get yourself 6 new screw gaskets, part number 311598 and 3 quarts of the lube with a pumper attachment. 2) Drain lower housing on left side, one screw down low and another near the cavitation plate. Remove both screws w/gaskets & drain. Gaskets sometimes stick in the holes - if so, take a small screwdriver & carefully pop it out. Then refill thru the lower until oil comes out the top. Install both screw with new gaskets. 3) Drain upper housing on right side. Turn outdrive full left & remove the 2 screws that will now be visible. Also remove the one in the top cover. When empty, install lower screw with new gasket & fill thru top until oil appears at the upper side screw. Install both with new gaskets. 4) Check oil level in clutch pack. Also make sure no water. Only one screw. If in doubt, then pull the 4 bolts & pop the cover off. Then install with new gasket p/n 308799 & fill with oil. 5) Grease ball gear shaft by looking between the intermediate & upper housings. You will see a small screw towards the left and a grease fitting equal distance to the right. Remove the screw then pump grease in until it comes out screw hole. Reinstall screw. after reading your input I wrote down notes and stopped by a marine shop looking for the goods. An interesting conversation arose. The head mechanic came out and was educating me on the sterndrive. He asked about the impeller and what kind of condition the unit was in before I drained the unit. I really don't know when the last time the impeller was replaced. or what kind of condition the drive is in, because I never got a chance to ask those questions. I'm thinking of taking this thing apart and replaceing the water pump unit, and o rings/seal. I will be online and buying a manual after thanksgiving. Spending all this time on this boat and crossing my fingers about the water pump makes me cringe. Plus I would like to put the boat in the harbor from time to time hoop lobster and fish. Mostly fresh water though. is there a complete rebuild kit with pump and seals? the ball gear looks to be in good shape, but after the conversation I am investigating this thing completely. I feel confident I can do the job myself. how much would a proj like this cost? any feedback? Thanks again for all the help. It also needs to be repainted. Gramps took a sander to the unit to the metal in some spots. paint preference? It was sitting in the water and has some calcium build up. thinking a douch with CLR and wire brush. should I replace the boot also? getting slightly costly here. I would replace the impeller & grease the water pump shaft splines. Really don't recall the grease OMC recommended back then but on later drives & outboard shaft splines they now recommend Moly Lube; That is what I use. Mercury Marine used to recommend 2-4C and now they have a "spline lube". Anything would be better that dry splines. 1) Disconnect the 2 shift wire knife splices above the tilt motor. Slide the rubber sleeve (p/n 303806) onto the boat end of the wire as it won't pass thru the hole in the intermediate housing. 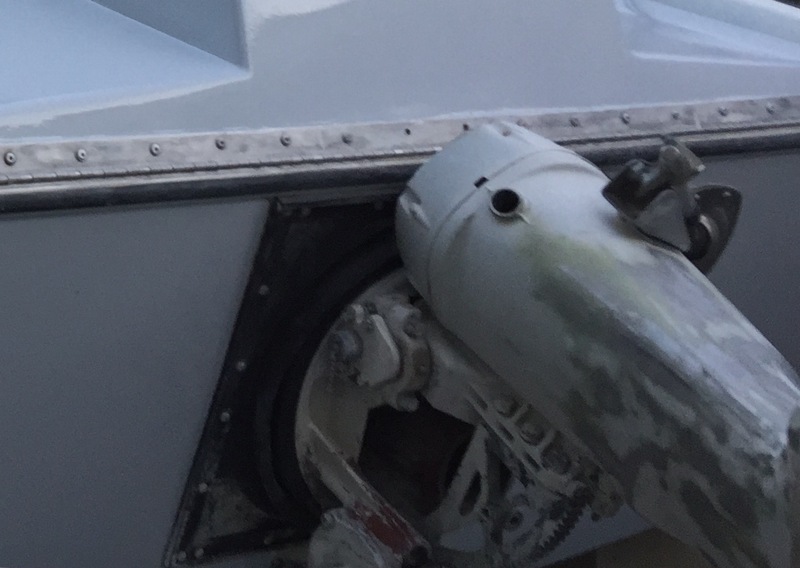 2) Tilt unit & turn hard right and you find where wires pass thru intermediate housing to upper housing (you are now outside boat). If there is a spring clamp, it must be squeezed & released prior to pulling wire thru upper housing. Regardless, pull the harness thru the upper housing & it will now be slack, hanging in a nylon clamp/spring assembly on the back of the upper. 3) At this point you remove the 4 bolts in the top cap of the drive & the lower unit/exhaust housing will slide down & off. Access to the impeller will be in the bottom of the upper housing which is still on the boat. Watch the orientation of o-ring and big nylon thrust washer on water pump swivel housing. If you get confused, beveled face of washer goes up against the radiused surface of swivel housing. Regarding resealing the drive, that is a wild card. If you found no contamination in the oil, then I would use the boat & frequently check the lube until you feel comfortable that it is OK. Due to the fact parts are not on every street corner & oil is cheap (I buy 5 gallon drum), I check mine often & depending on the amount of usage, change it mid season as a precaution. I don't believe there was a seal kit for the 1st generation (pre 1968) drives. The 1st generation was quickly identified by the fact there are 4 bolts in the top cap - yes the 4 bolts mentioned above to remove the drive. The primary difference was the fact they were assembled with pre shimmed assemblies. In 1968, they started using 5 bolts. These drives were shimmed upon assembly so, some parts & procedures were different. Just the fact you found a mechanic that would discuss the drive with you is impressive. His input is good but his knowledge of the electric shifts may be limited. Fixed the wiring under the dash today. bit of a mess since I removed the gauges over a year ago and don't remember which is which wire. and over the last 50 years some very interesting combinations of wire fixes have been done. Now all gauges and lights work. got the blower and sump pump goin. Every time I walk back around the stern I look at the drive and stare at it for a minute or two. got a seloc manual in the mail. should be here soon. Gonna tackle the drive. Do you have a part number or preferred manufacturer for the impeller? Marine engine.com looks pretty good, but Im still hesitant on picking the correct parts. So it sounds pretty straight forward and I like the idea of keaving the upper unit attached, and tilting the drive up so I can get in the housing without removing the whole darn thing. One thing is for certain. Folks have things mixed up in terms of the exact method of this repair and model of the drives. Impeller p/n 379475 supersedes to 777130 still readily available. Check out these 2 links. drained the oil in the lower unit and it was milky brown. bummer. got the omc manual in the mail. followed instructions broke off two of the four bolts in the exhaust housing. bummer. surprised to find four 1/4 20 alum bolts hold that housing on. anyhoo, the housing would not budge. the bolthead snapped. I drilled 1/8 down to make sure nothing was holding the housing in the broken bolts. started to get sloppy so I stopped. and it doesn't look like the top cap is threaded, so it should slide off. darn thing wont budge. used a mallet nothing. what would you do? Bolts should be stainless, not aluminum. They are what actually holds the lower unit up in position. You say you "drilled 1/8 down" Does that mean 1/8 inch below the head? If so, then you are still in the top cap & that is good. You must be dealing with corrosion. Soak with penetration oil (I like Kroil but you may need to special order it) both where the screw heads were & along the mating flange of the cap to exhaust housing. Heat with a propane torch. You may need to repeat the soak & heat cycle. If the 4 bolts are all broken, it will eventually slide off. If some bolts are still OK, try to get them loose. Got into it with a propane torch and blaster penetrant. My dad has the aero kroil can sitting on his shelf. been using it for decades now. but that's a few hour drive. yup. not a budge yet. ave a good smack and shake. the drive shaft must be rusted. maybe I should turn the prop over forward and reverse. maybe the splines need to move a smudge. going back to work tomorrow, be back in a few days. hoping the unit will just fall off and all the seals will come ack to life in the lower unit this week. and when I get back the housing will be resting on the ground and ready for me to get into when I get back. when a butterfly lands on it, should slide down nice and easy for me. Havent drained the oil in the intermediate yet. or upper unit as they say. But I did remove the steering linkage hoping that was keeping it up. I'm gonna heat it up and smack it good when I get home on Friday. again. And if the oil was milky in lower unit, will the seals in the pump kit do? or am I looking at rebuilding the whole lower? I'm in a little trouble here aren't I.
OK, so you have only drilled the heads off in the top cap. That is good cause you will still have shanks showing WHEN the drive does indeed decide to slip down. So you will have something to hopefully grab with a vise grip & work the threads out of the exhaust housing. I suppose the 4 bolt shanks could be holding you. If not that then the splines must be nasty & dry. Try removing the bolts (should be 6 bolts pointing up) from the exhaust housing to the lower unit. If the cap is loose (the bolts shanks are not what are holding you), then the cap can be lifted off and you will see into the upper housing. I believe you will see 2 little slots between the cap & exhaust housing where you can put a screwdriver & carefully work it up. The water pump is on the bottom of the upper unit, servicing the water pump will have nothing to do with resealing the lower unit. Finally got the unit off and replaced the impeller. Could not find the entire pump kit, obviously because they don't make that model anymore. Put everything back together and no water circulation. I was sure to follow the manufactures instructions, and I was concerned about the direction of the impeller blades, but sure enough counter clockwise as the manual states. ?? I used quicksilver marine sealant on everything. When I have the hose hooked to the transom water flows through the block, and ultimately comes out of the bottom of the lower unit. Is this where water is supposed to exit? And I could not see any water exiting when I had the boat in the water. When I was pulling the lower unit from the exhaust housing the brass water pipe had a bit of a pinch in it. Primarily because to separate those two pieces, there is a bolt under that pipe and to het a socket on it I pinched it a bit. The vertical drive shaft turns clockwise looking down. 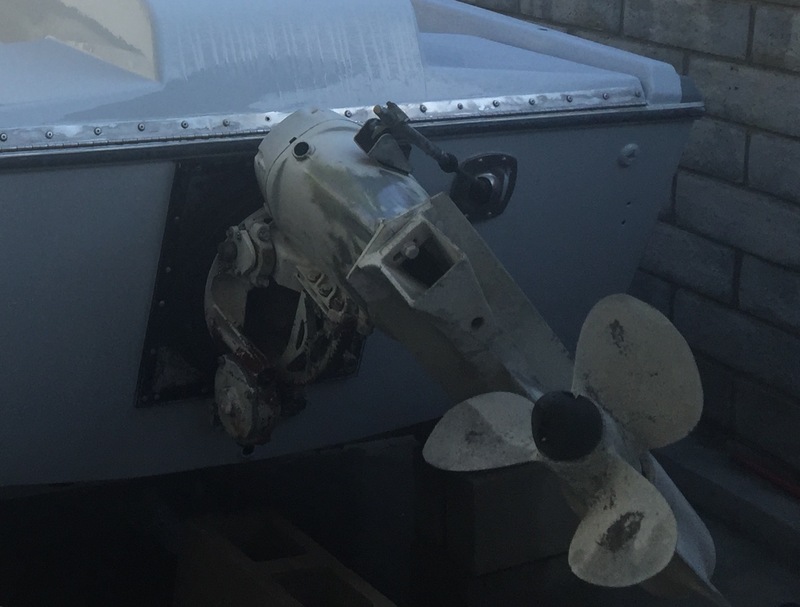 So regarding the direction of rotation of your impeller, you need to verify that it is in correctly. Just for verification, the boat will at least drive (as in spin the prop under load)? I ask this to be sure the drive shaft splines are not faulty. With the garden hose connected to the trunion, city water pressure is causing the circulation, the water pump is just on the upstream side of the pump being cooled/lubricated by the water trying to escape backwards thru the water intake ports. Why it isn't pumping in the lake????? Did you take boat off trailer or just back in part way? It is possible to not submerge the water pump by just backing in part way. You should be able to remove the 5/8" cooling hose (water supply) from the t-stat housing and verify if it is pumping water to the front (automotive style circulating) pump. Yes Jim sounds like I'm corrrcg on impeller direction. I also used a thick flat washer custom ground instead of the impeller key. But it fit well so that could potentially be a problem. Yes I backed the boat in at the boat launch. And the boat was in the water far enough. The splines were in good shape and she god in and out of reverse and forward. It made a bit of a. Link but the idle was a bit high. I will pull the hose at the housing and see it I get water up that high. Water would not circulate with the hose attached if the thermostat was faulty right? I'm thinking it's the key way or slightly pinched copper tube. But I will check and see if I get water to the thermostat first. Water will flow to and fill the engine block regardless of T-stat condition. I would definitely use the correct key. Even if yours functions now, it will corrode & cause issues later. Don't think a slight kink is the issue. Took the boat back down to the harbor today. Sure enough no water coming to hoses at thermostat. Only hot air. I will get back into the water pump later in the week. And I will put the key in. Lost it and used it in a pinch I hope that is the problem. The copper hose is not completely closed to it should at least flow a little bit of water. Something is going on with the impeller. I should be very efficient this time around though. I'm getting good at tearing down these little omc units. . I will also look at the brass suction line. Regardless of the slight bit of bad press these OMC "fossil drives" receive, I've had 5 (3 right now), all electric shift and loved them.